A beautifully simple and satisfying tart! This is a classic French dish, the Quiche Lorraine. Julia Child shared a recipe for Quiche Lorraine in her timeless Mastering the Art of French Cooking, vol. 1. 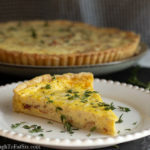 A classic quiche is simply a custard of eggs and cream in a pastry shell, usually in a tart pan. 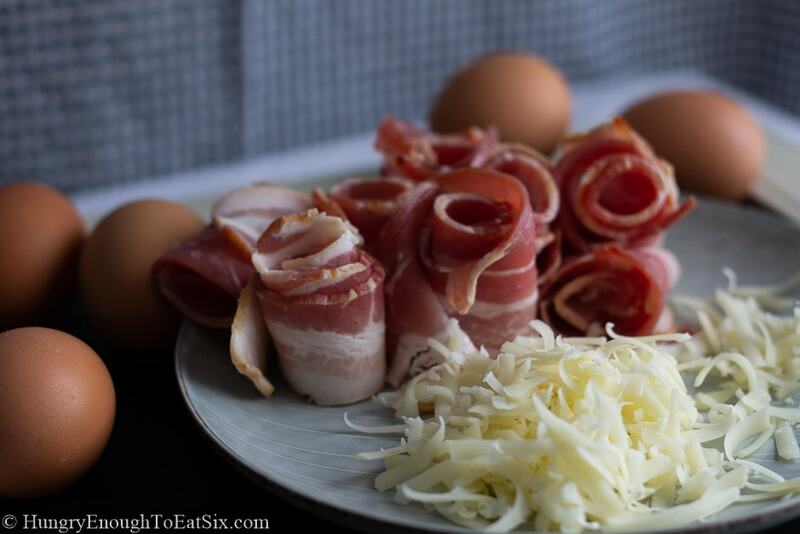 The Lorraine variation was created in the Lorraine region of France, and adds bacon (lardons, originally) and usually cheese like Gruyère or Swiss. This is going to sound completely random, but Quiche Lorraine always makes me think of one, tiny scene in To Catch A Thief. It was a food scene so, you know, it caught my attention! When I taste Quiche Lorraine it reminds me of that scene, and of the sophisticated characters obsessed with jewels in the French Riviera. The scene is when Cary Grant’s character, John Robie the thief has H.H. Hughson, played by John Williams, up to his villa for a visit. They discuss the lunch prepared for them by Robie’s housekeeper, Germaine. And now back to the food. Buttery pastry dough lines the tart pan and then gets blind-baked to ensure a crisp, flaky crust under all that filling. Once baked, the bacon and shallots cover the bottom. The shredded Gruyère goes in next, followed by the egg and cream mixture and a little more Gruyère over the top. When the quiche comes out it looks like this: lightly browned, eggs perfectly set and the whole thing quite fragrant! This is just delicious for a savory breakfast, and it can be made ahead – the day before and reheated for the meal. It can even be frozen! 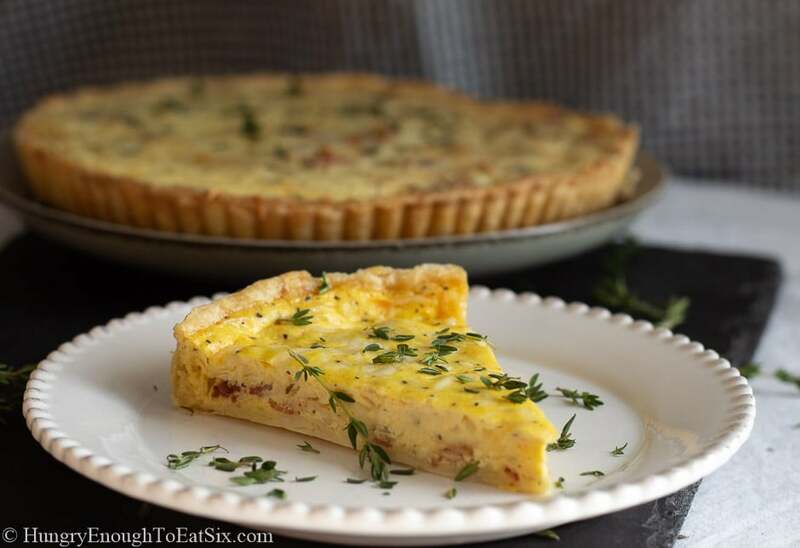 The recipe for this classy and tasty Quiche Lorraine is below. 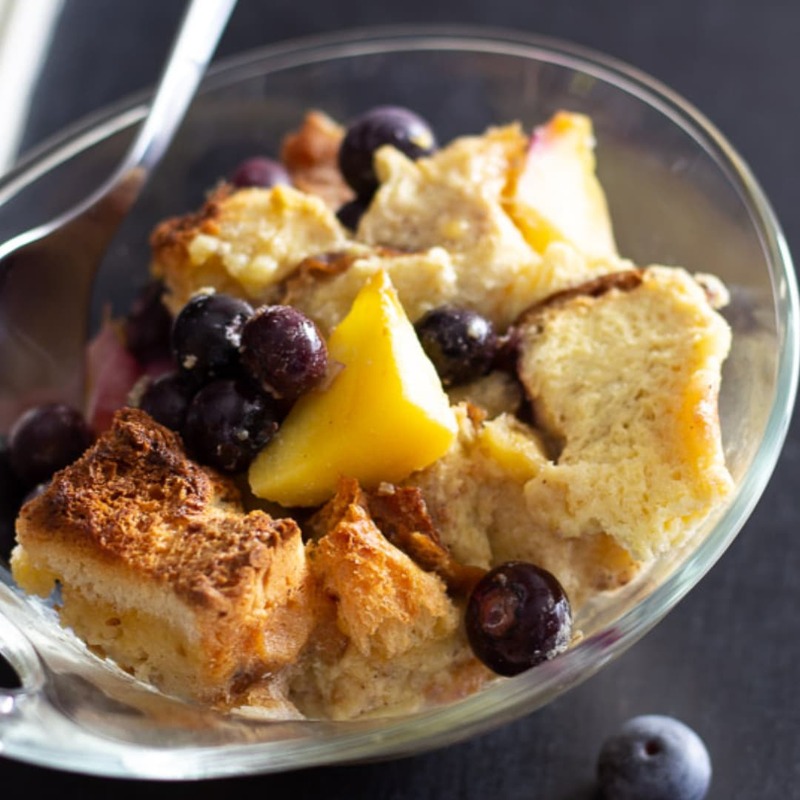 Here are some other Make-Ahead Breakfasts you can consider! 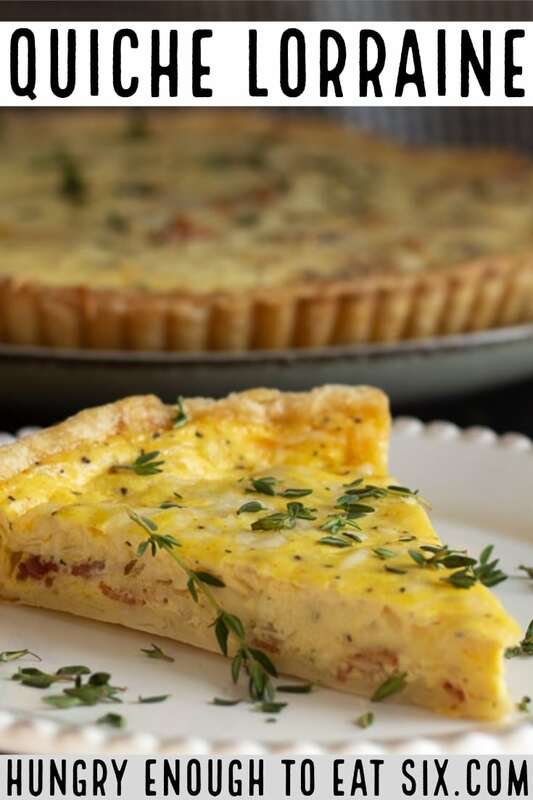 This is a classic quiche with bacon and Gruyère cheese, a sophisticated and more importantly, delicious choice for breakfast or lunch! Have ready a 10-1/2-inch tart pan with a removable bottom. Roll out the Buttery Pastry Dough on a lightly floured surface, to a diameter of about 13 inches, and the dough should be about 1/4-inch thick. Carefully move the dough to the tart pan and fit the dough into the pan: do not stretch the dough to make it fit. Instead, lift the edges of the dough to move it into position. Press the dough into the bottom and sides of the pan. 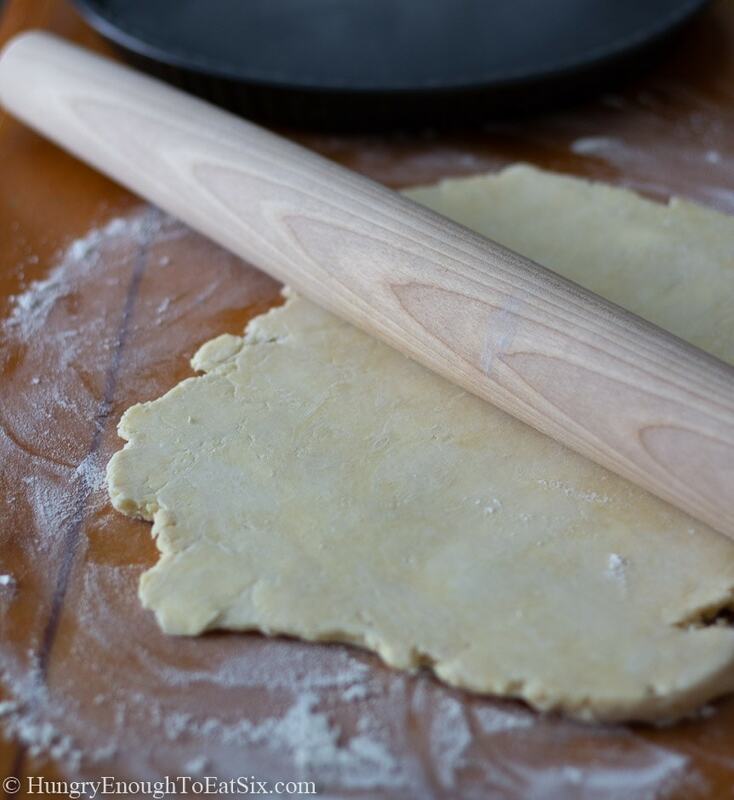 Roll your rolling pin over the top of the pan to shear off the excess dough, so that the dough just reaches to the top edge of the pan. Prick the bottom of the dough with a fork several times. 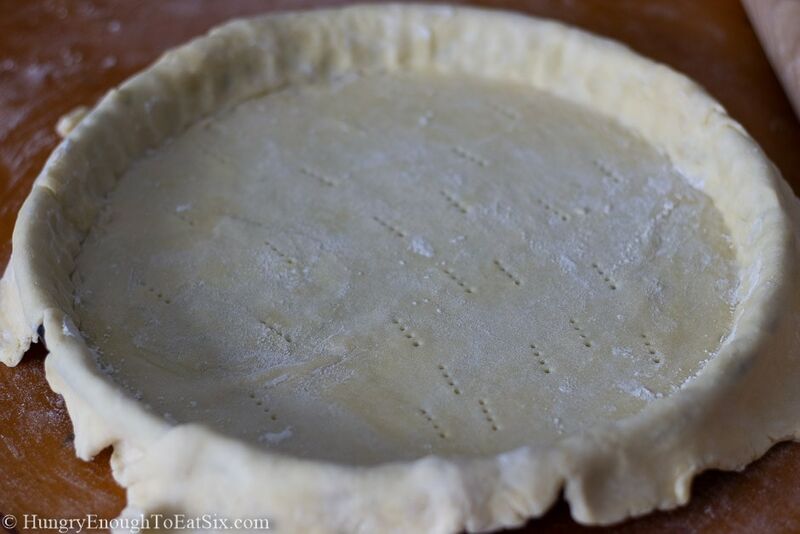 Line the pastry dough with foil and then fill the pan with pie weights or dry beans up to the edge. Drape a piece of plastic wrap over the top and refrigerate the pastry shell for 30 minutes. 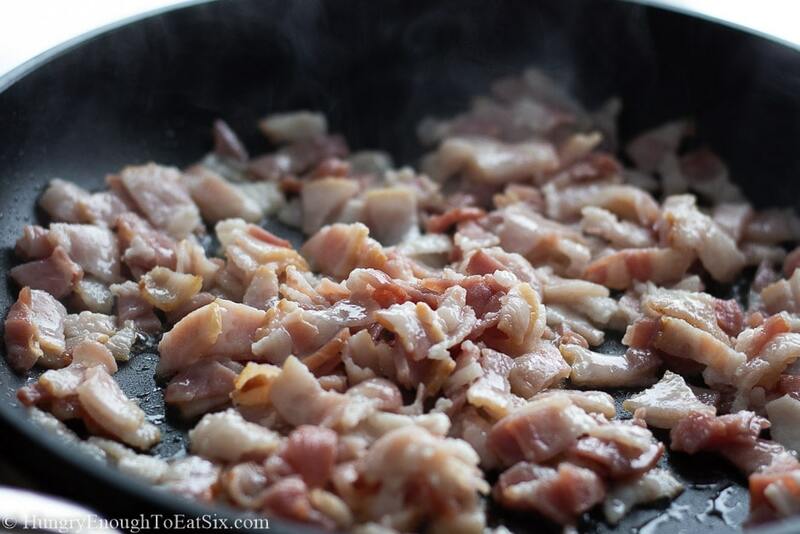 While the dough is chilling, saute the chopped bacon in a skillet over medium-high heat until the bacon is browned and crispy. Remove the bacon and hold it aside. 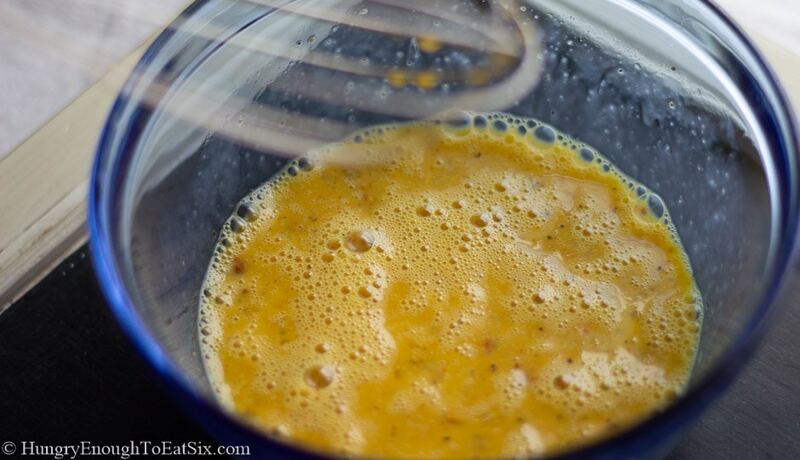 Drain off the fat, reserving 1 tablespoon of the fat. Return the skillet to the stovetop and add the reserved tablespoon of fat to the pan. Add in the chopped shallots, and saute them over medium heat for about two minutes. They should soften fairly quickly. 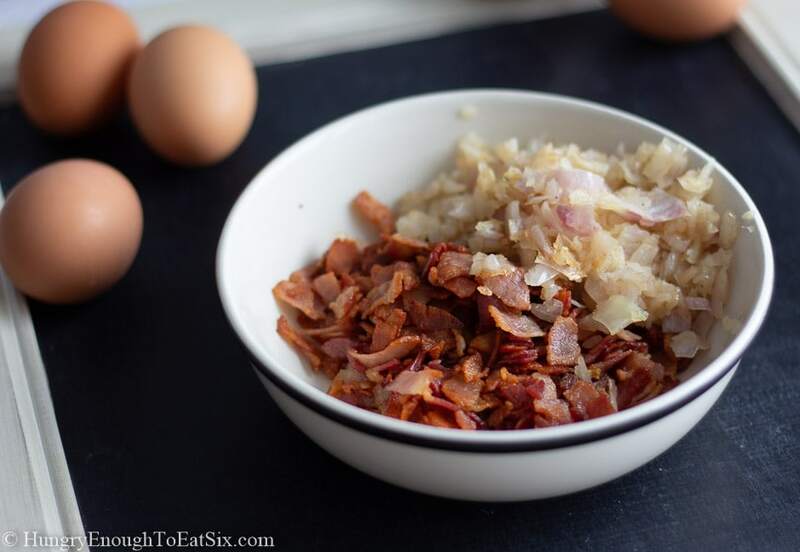 Remove the shallots from the pan and add them to the cooked bacon. Toss the two together. Remove the pastry shell from the fridge and remove the plastic wrap. Bake the shell for 20 minutes. Take the pie shell out of the oven, and remove the beans and foil. Add a few more fork pricks to the bottom of the shell if it is puffing up, and then bake the shell for 10 minutes longer. Remove the tart pan to a cooling rack. Increase the oven temperature to 400° F.
In a large bowl beat the eggs together with the thyme, salt, garlic powder, black pepper and cayenne pepper. 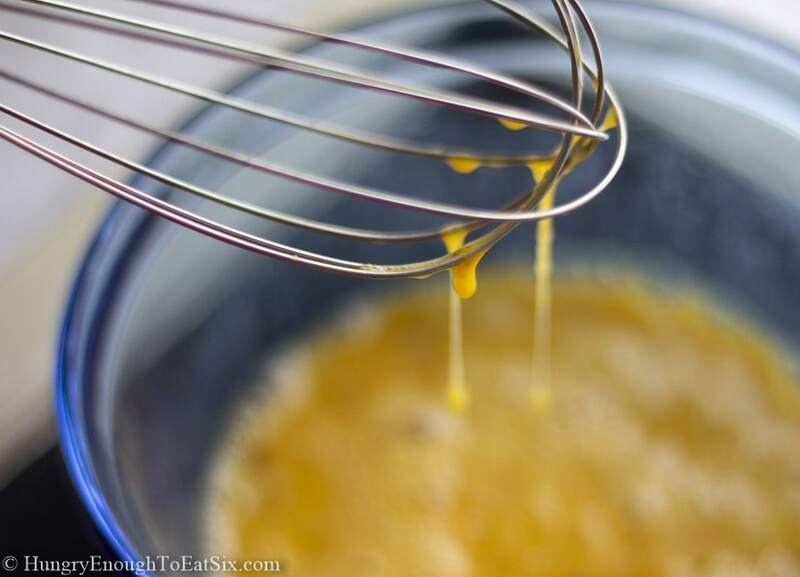 Add in the half & half and milk, and whisk the mixture together thoroughly. Place the pan with the tart shell on a baking sheet. (This will make it easy to carry to the oven.) Spread the bacon and shallot mixture over the bottom of the tart shell and sprinkle 1 cup of the shredded Gruyère over this. Carefully pour in the egg-cream mixture to just below the edge of the crust. (You may have just a little more filling than you need, depending on how much your crust puffed up.) Sprinkle the remaining cheese over the top. Place the baking sheet with the quiche in the oven on a rack positioned in the center. Bake the quiche for 15 minutes. Then, reduce the temperature to 325° F and bake the quiche for another 30 minutes. It should be lightly browned in places and look set. You can test it with a knife inserted in the center if you want, and it should come out clean. 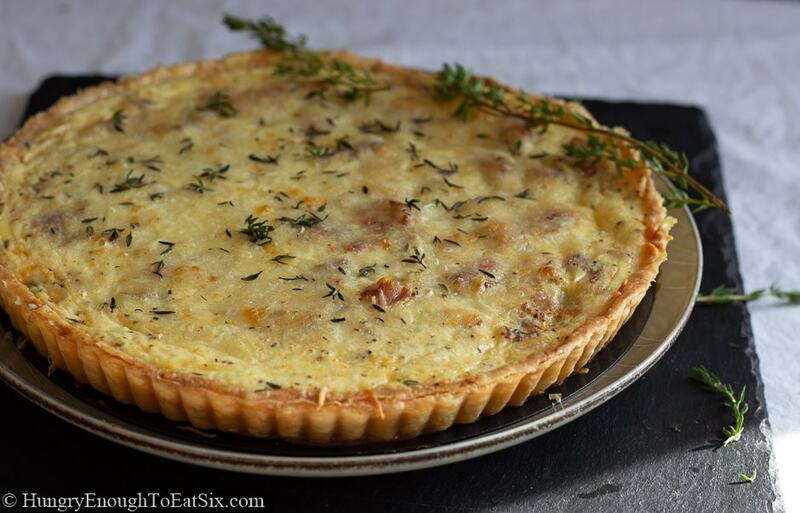 Allow the quiche to cool on a wire rack for at least 15 minutes before slicing and serving. You can also serve it at room temperature. Makes 6 servings. 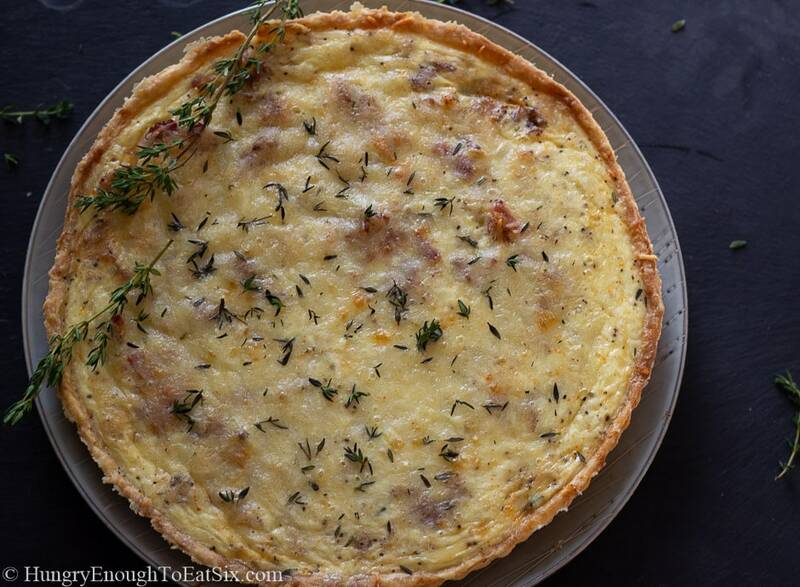 After baking the quiche can be wrapped and stored in the fridge for up to 3 days. It can also be well-wrapped and frozen for up to 2 months. Allow it to thaw in the fridge and then reheat it at 350° F.
This recipe is based on using a metal tart pan with a removable bottom. If you choose to bake the quiche in a glass or ceramic pan, move the oven rack to a lower position to help the bottom crust bake through properly. How do you like my Quiche Lorraine? Have you seen To Catch A Thief? Leave a comment for me below and click the stars to rate the recipe! 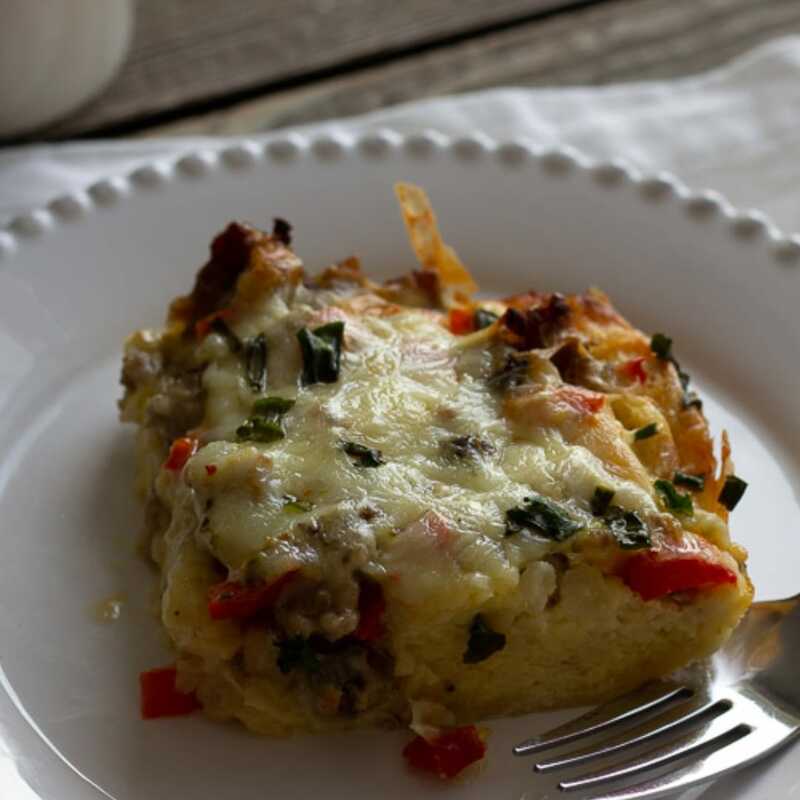 Previous Post: « Spicy Egg & Sausage Breakfast Bake. A Make-Ahead Breakfast! I think you guys would love this quiche, so tasty!